Ateneo's Kai Sotto tries to force a shot against FEU defenders. 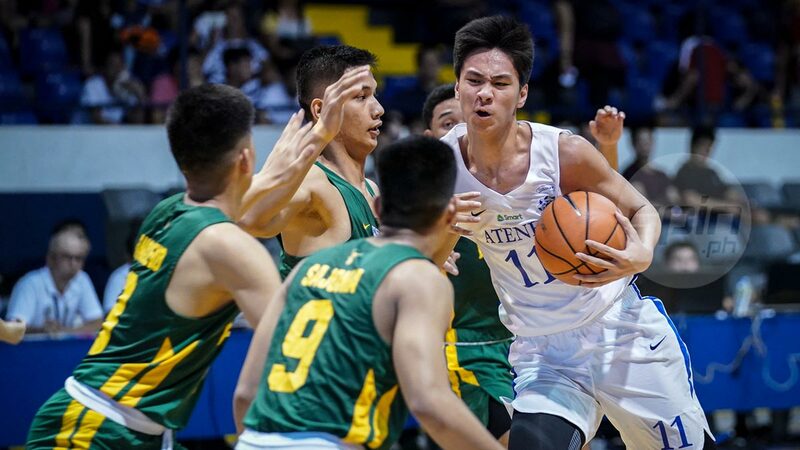 RJ ABARRIENTOS hit four three-pointers in overtime as Far Eastern University dealt Ateneo de Manila its first loss in the UAAP Season 81 juniors basketball tournament, 87-80, on Sunday at the Blue Eagle Gym. FEU forced a four-way tie for second with Ateneo, Adamson and De La Salle-Zobel at 2-1 behind National University at 3-0. Abarrientos missed the potential game-winner in regulation but made up for that in the extra period, nailing back-to-back triples that gave the Baby Tams a 78-72 lead with 1:52 to play. The Eaglets got to within one, 78-77, with 1:24 left as as Ian Espinosa split his free throws and Sotto scored on a putback before JR Jaymalin made his charity shots. But Abarrientos came to the rescue anew, again making two straight triples, to push FEU’s lead to seven, 84-77. Abarrientos, who played through leg spasm and played limited minutes in the second half, finished with 28 points highlighted by eight triples. Xyrus Torres hit six three-pointers and finished with 21 points, while Bryan Sajonia added 14 points and six rebounds. Sotto led Ateneo with 31 points, 14 rebounds and six blocks. Geo Chiu had 11 points and as many as rebounds, while Espinosa added 10 markers, five rebounds and three assists. The Junior Archers earned their second win as Lance Jomalesa posted a double-double of 15 points and 19 rebounds in a 55-48 win over the winless UPIS Junior Maroons. Ralph Labao had 11 points and 10 rebounds for UPIS (0-3). FEU 87 - Abarrientos 28, Torres 21, Sajonia 14, Alforque 7, Anonuevo 6, Bautista 5, Libago 4, Tolentino 2, Oña 0, Barasi 0, Bagunu 0, Sicat 0. Ateneo 80 - Sotto 31, Chiu 11, Espinosa 10, Diaz 8, Fetalvero 7, Jaymalin 6, David 2, De Ayre 2, Coo 2, Salandanan 1. Quarterscores: 19-25; 33-40; 52-55; 70-70; 87-80. DLS-Z 55 - Jomalesa 15, Subido 13, Villarin 8, Cudiamat 5, Sevilla 4, Milan 4, Pingol, Macasaet 2, Cortez 0, Dee 0, Pascual 0, Danao 0, Buncayo 0, Marana 0, Unisa 0. UPIS 48 -Labao 11, Vergiere 9, Torres 8, Tuzaon 6, Gomez de Liano 3, Napalang 3, Lopez 2, Cordero 0, Villaverde 0, Dimaculangan 0, Armamento 0, Abreu 0, Galotera 0. Quarterscores: 18-5; 32-20; 42-29; 55-48.